This will become a mixologist’s favorite as it allows them to be far more creative than usual, as this is a liqueur that goes with tequila, rum and gin, and virtually every other spirit out there. Created by the progressive distillery Heaven Hill in Bardstown, Kentucky and retailing for $24.99, this is the first ever Agave Nectar Liqueur. 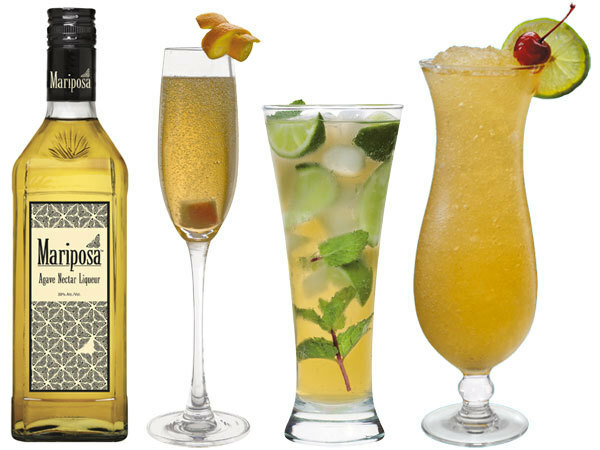 Agave Nectar is a natural sweetener, and this version it is transformed into an elegant spirit product as it is combined with not only tequila, but also virtually every other spirit you can name. At an exclusive launching at the hip boutique hotel Le Petit Ermitage in West Hollywood, the lucky few in attendance were the first to appreciate this new innovation in cocktail enhancement. There are slight hints of rose oil and gardenia in the mix, and part of the marketing push will be geared towards the amateur mixologist at home, although the ultimate success will depend on the pro’s who have seemed to take an early enthusiastic approach. Golden in color, the liqueur also has hints of roasted pina and grapefruit zest and tastes rather fruity with orange blossom and even juniper berry. Mariposa means butterfly in Spanish, and is named after the Monarch butterfly that is indigenous to the Tequila region in Mexico. Initial cities it is being launched in include New York, Boston, San Francisco, Los Angeles, Miami, Denver and Chicago. Combine ingredients except Ginger Ale into shaker, shake vigorously and pour into Collins glass with ice. Top w/ginger ale. Combine liquid ingredients in a shaker and rim stemmed glass w/sugar. Shake ingredients and pour into rimmed cocktail glass, express lemon over top.